Embroidered NHL shield at the collar. Sewn Reebok logos. Fit: Loose fit. This is not an athletic cut. Jersey fits loose in the arms and body. NOTE: We take one set of photos for each jersey and use them for all sizes in our inventory.This item is a size S.
Embroidered NHL shield at the collar. Sewn Reebok logos. NOTE: We take one set of photos for each jersey and use them for all sizes in our inventory.This item is a size XL. XL 25 25 1/2 22. Fit: Loose fit. Embroidered NHL shield at the collar. Sewn Reebok logos. XL 25 25 1/2 22. Fit: Loose fit. This is not an athletic cut. Jersey fits loose in the arms and body. NOTE: We take one set of photos for each jersey and use them for all sizes in our inventory.This item is a size L.
Embroidered NHL shield at the collar. Sewn Reebok logos. Fit: Loose fit. This is not an athletic cut. Jersey fits loose in the arms and body. NOTE: We take one set of photos for each jersey and use them for all sizes in our inventory.This item is a size L.
Embroidered NHL shield at the collar. Sewn Reebok logos. NOTE: We take one set of photos for each jersey and use them for all sizes in our inventory.This item is a size 2X. 2X 26 1/2 27 24. Fit: Loose fit. The hockey rink isn't the only kind of ice your youngster likes! Let her sport her passion for the finer things in life with these Boston Bruins Diamond leggings from Reebok. They feature a wide elastic waistband for comfort, and flatlock stitching in a contrasting team color for a sporty pop of pride. BOSTON BRUINS REEBOK Women's Mitten's One Size Fit's Most! Boston Bruins REEBOK Short Sleeved Shirt V NECK Women's Size Large White Solid NWT $30 Condition is New. Shipped with USPS First Class Package. Boston Bruins REEBOK Grey Long Sleeved Shirt V NECK Women's Size XL Gray Solid NWT $35 Condition is New. Shipped with USPS First Class Package. Boston Bruins REEBOK Short Sleeved Shirt V NECK Women's Size Extra Large White Black NWT $30 Condition is New. Shipped with USPS First Class Package. The teams faux worn emblem and script are printed directly on the front. Contains front pockets, a nice quality weight item. 50% cotton, 50% polyester. Raglan sleeves. Machine wash. Long sleeve. Color Black. Type T-Shirt. Product Details. 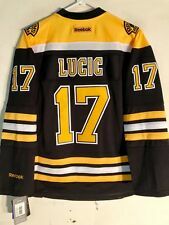 It has the Bruins team logo printed on the front in gold. 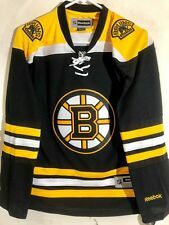 Also, contains the embroidered Reebok emblem on the back of the neck and BOSTON printed in gold on the lower sleeve and has the embroidered NHL collar shield stitched on. TIM THOMAS #30. LENGTH: 26". PIT TO PIT: 18". LIGHT WEAR. 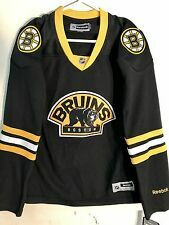 BOSTON BRUINS heather Gray Gold Jersey look Cotton blend T-shirt Reebok S. Condition is Used. Shipped with USPS First Class Package. 34" chest. 27" total length. Reebok logos. Light weight materials. Team graphics and NHL shield are screen printed. 2X 28 29 1/2 24. NOTE: We take one set of photos for each item and use them for all sizes in our inventory.This item is a size 2X.